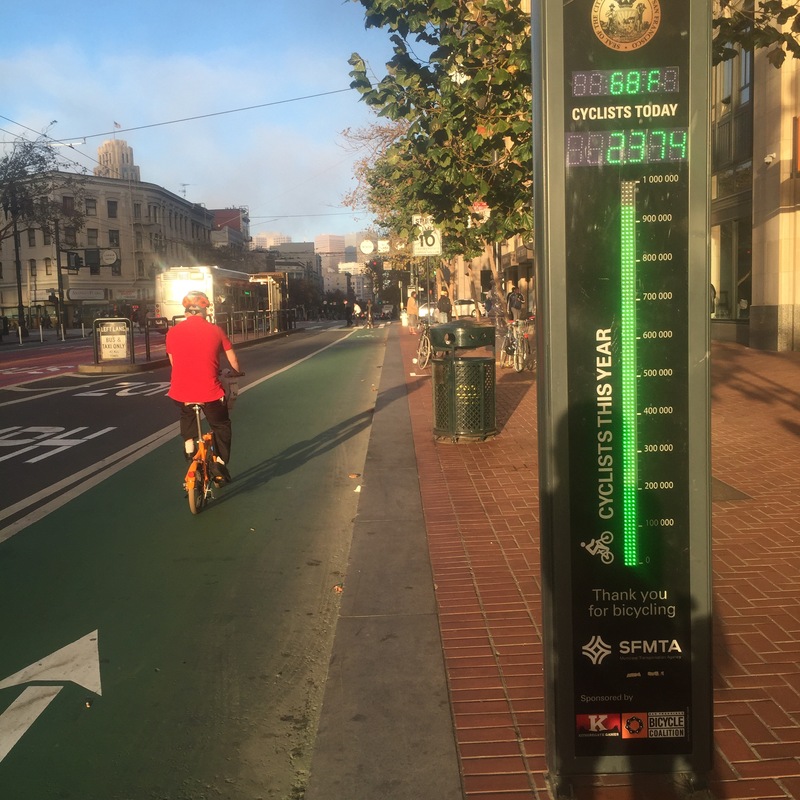 I think I was the 2,368th eastbound cyclist on Market street yesterday. 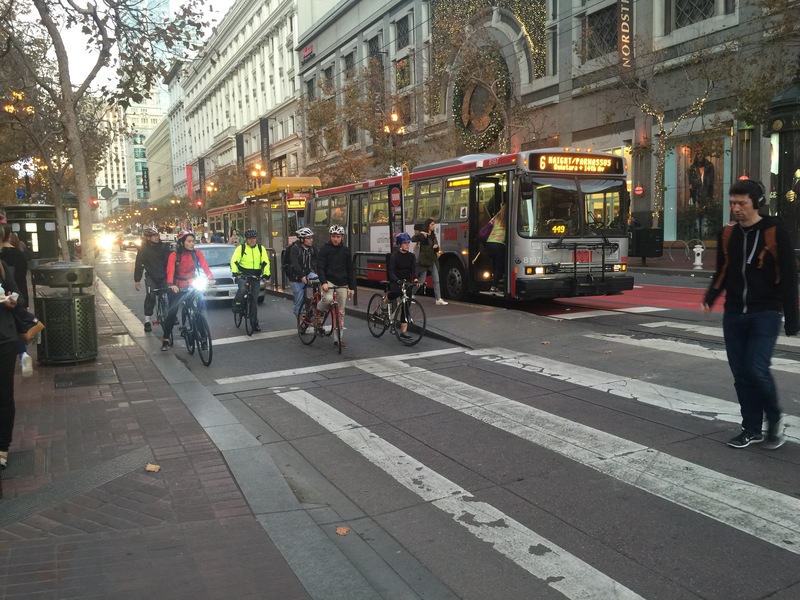 The city has an impressive volume of cyclists which really picks up during the evening commute, below. 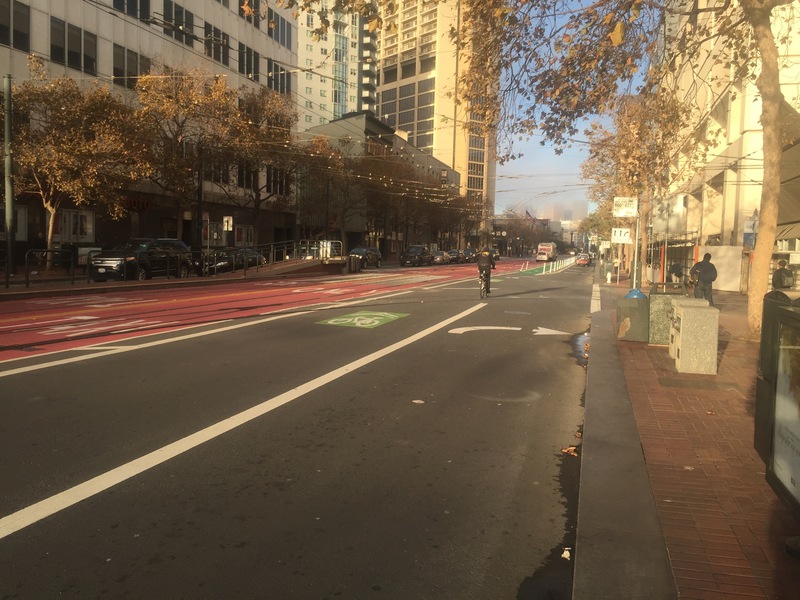 Market Street’s bikeways were recently upgraded to a variety of buffered and pigmented lanes. Private vehicles are still allowed though discouraged from the red zones reserved for trains and taxis. 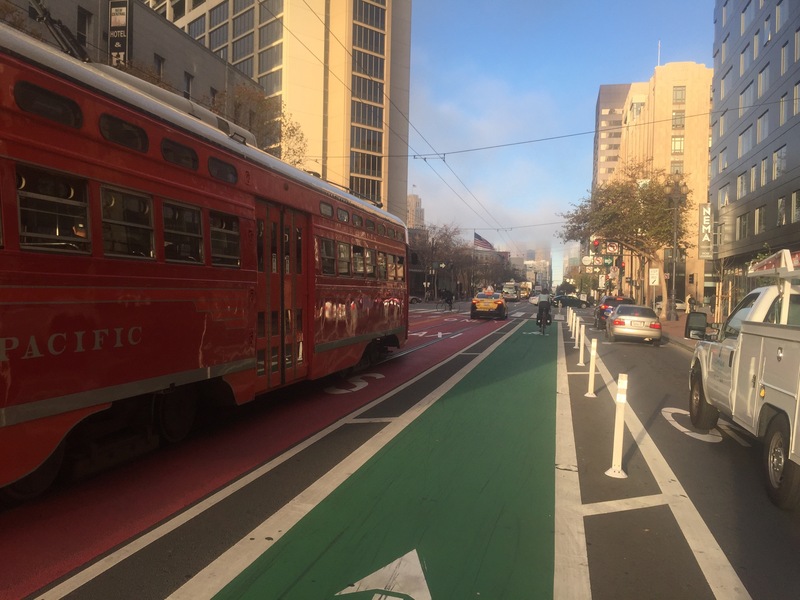 In other stretches bikes share the space with cars, below. .. in other places they share them with cars. Here that’s seen with a speed restriction posted (though neither cars or bikes seemed to abide by it). 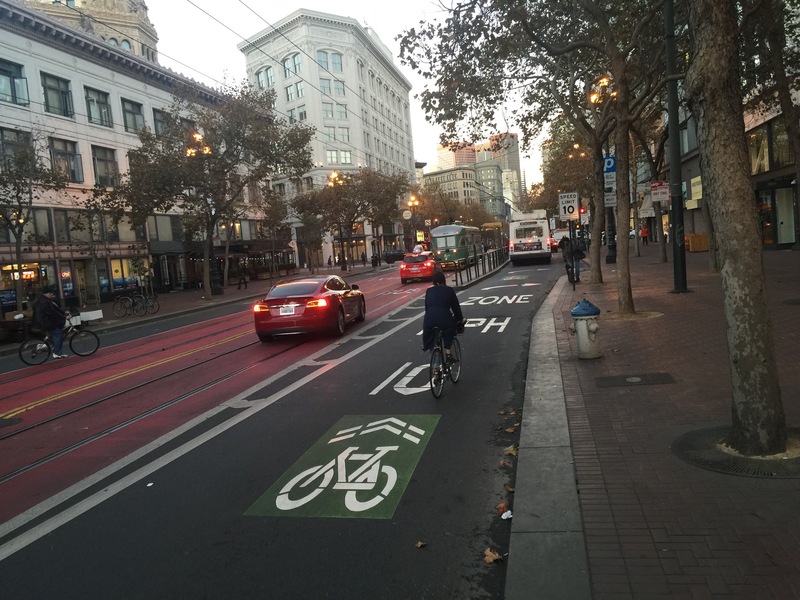 Polk Street (below) is a one-way street that comes into Market that recently got a contra-flow bike lane. Here it is even protected with a narrow island. 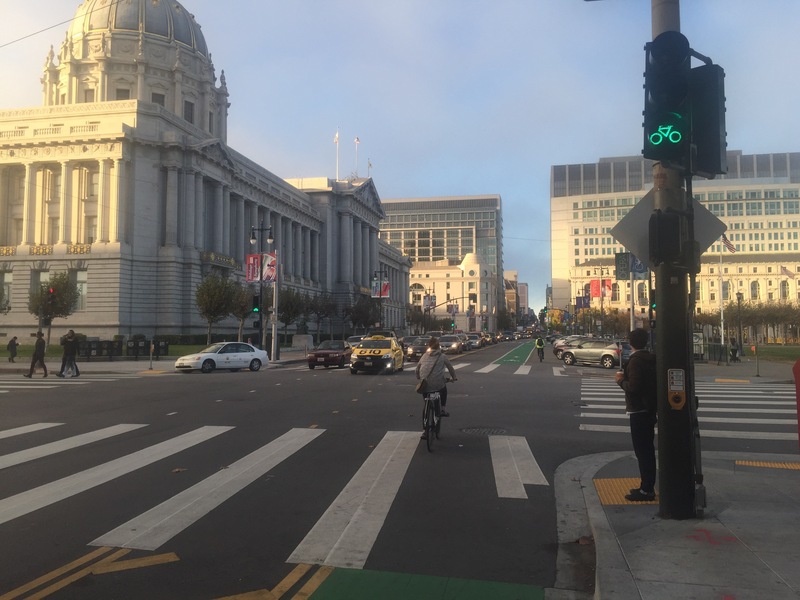 Closer to the City Hall it is just striped and equipped with bike-specific signals. 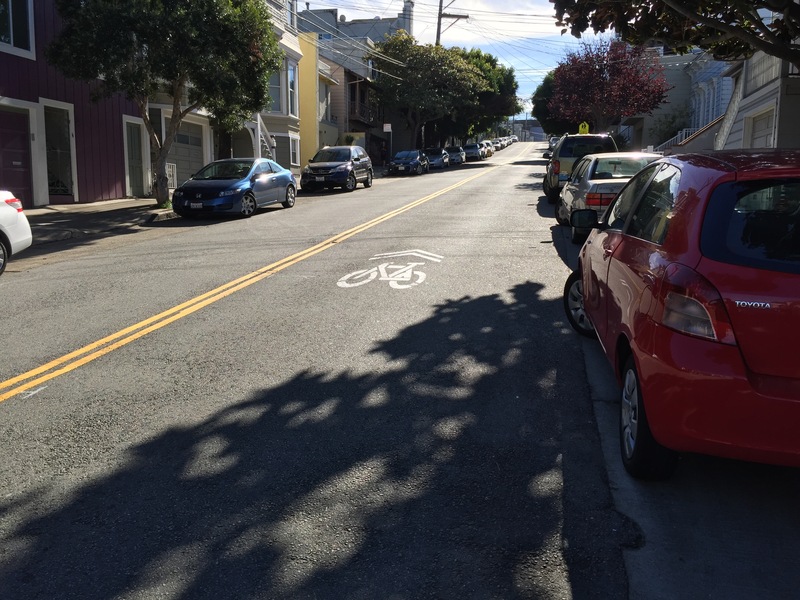 Note the back-in angle parking on the far side, a nice way to orient parked cars so drivers have a direct view of cyclists as they prepare to pull out. 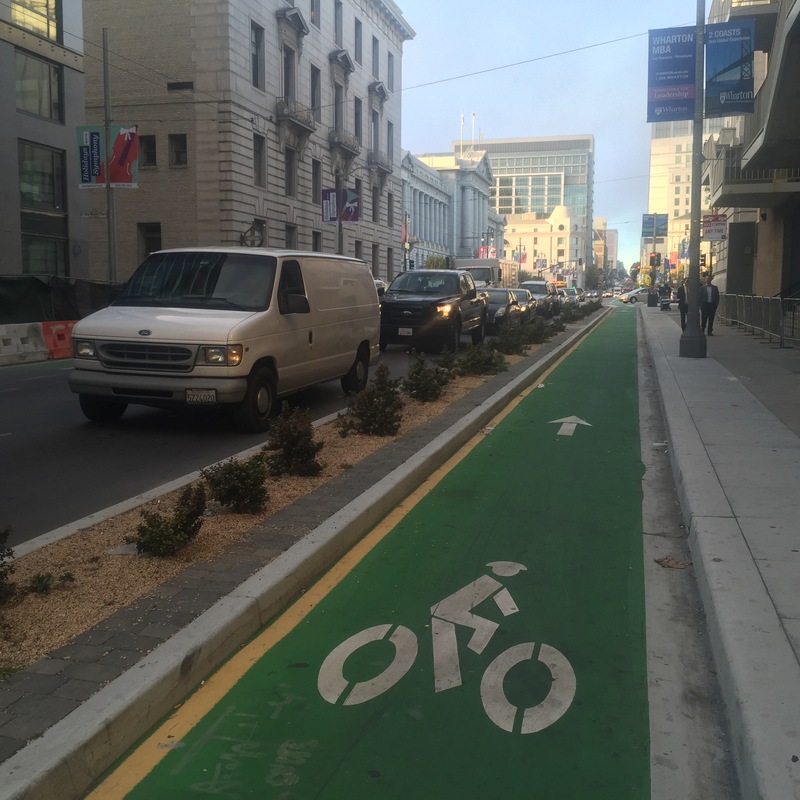 It looks like the parking access lane runs opposite the main traffic flow, which seems odd to me but I’m glad to see that the city is willing to try unique solutions. 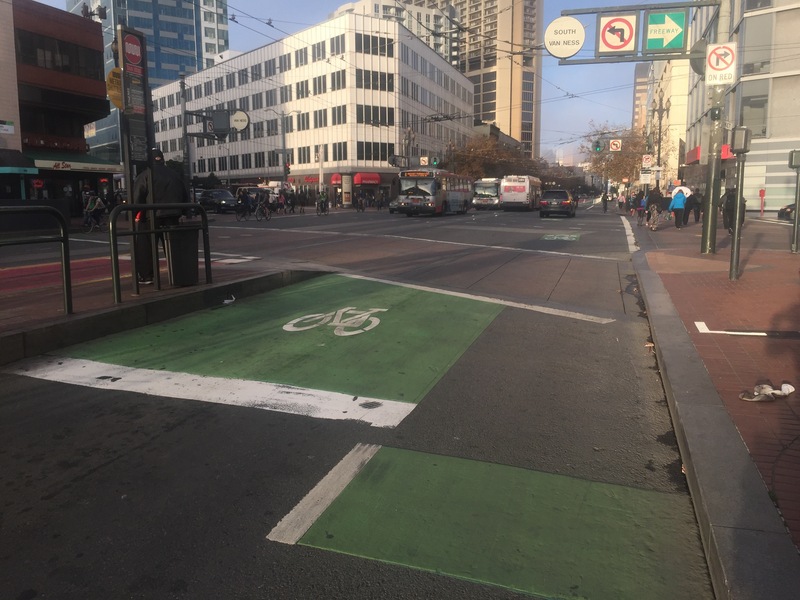 Bike boxes are sprinkled throughout the city where needed. 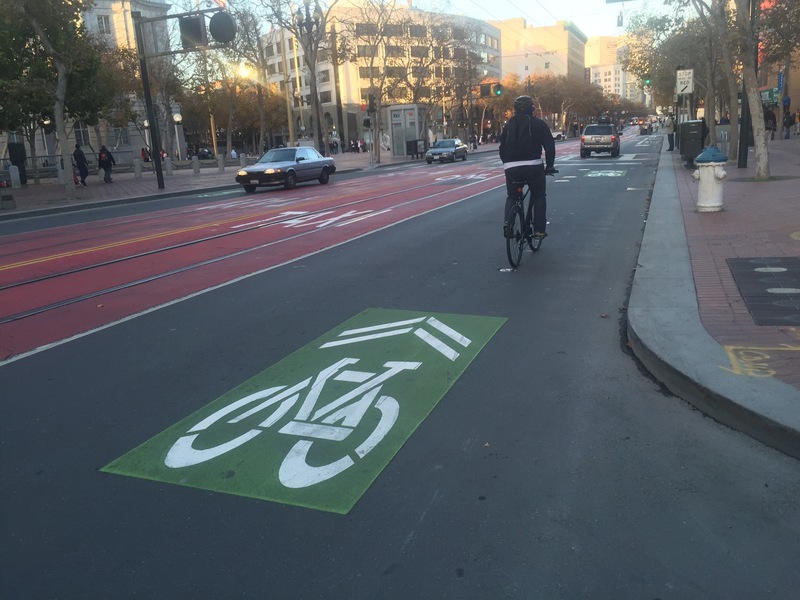 They allow cyclists to position themselves at the head of the line so they can make a safe start when the lights change. 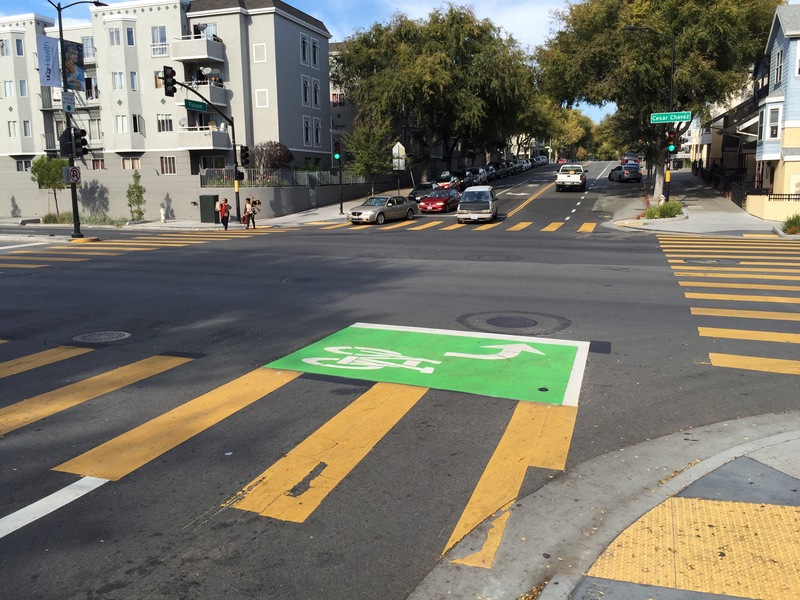 The one below is designed to facilitate a two-step left turn. 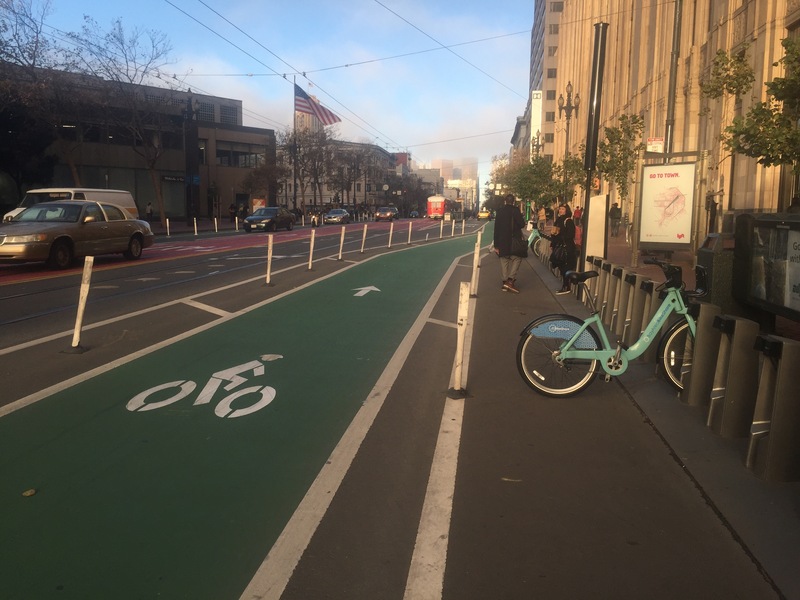 Yep, the city has bike share, apparently well used, judging from this near-empty dock area along Market, below. Below you can see the density of docks throughout the downtown area. 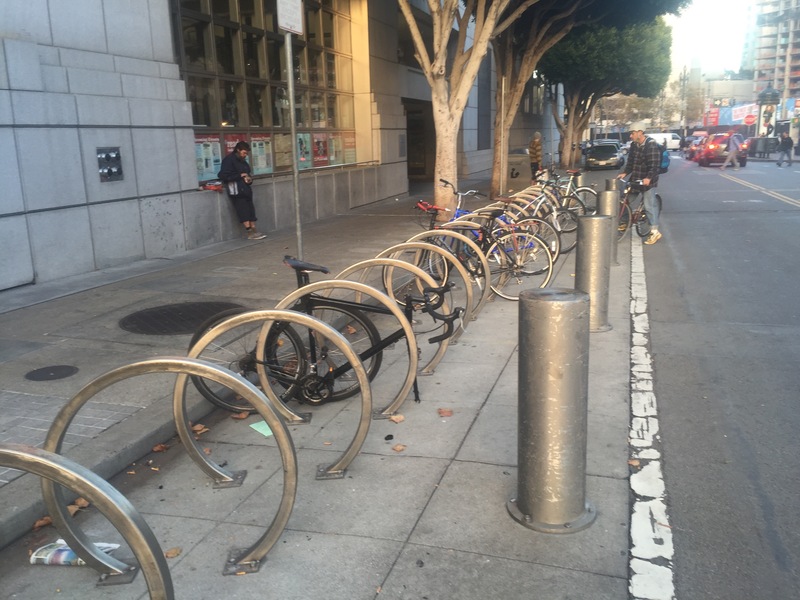 This bike corral is protected with very beefy bollards, a much different approach than the plastic, deflectable bollards that Santa Monica uses around their corrals. 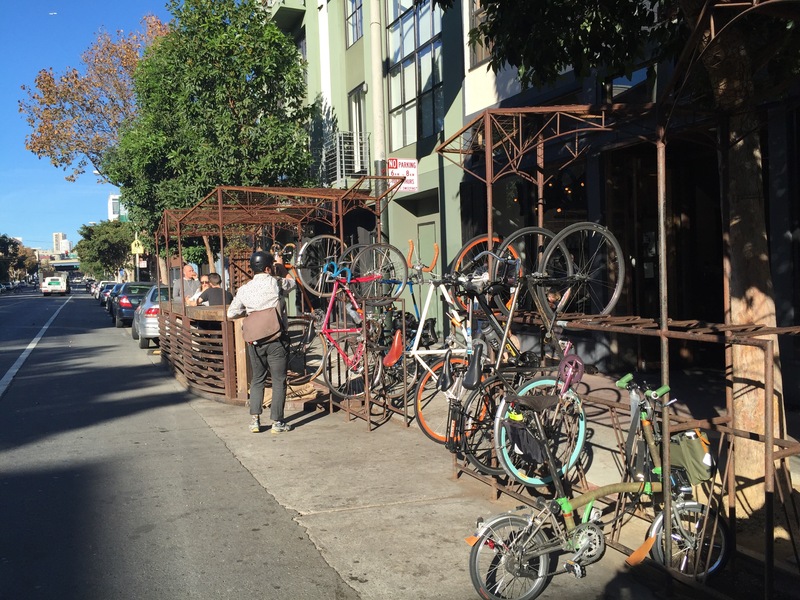 Below, a clever high-capacity bike rack integrated into a parklet in front of Four Barrel Coffee on Valencia. Not compatible with my Brompton, but I just brought it in with me as usual. 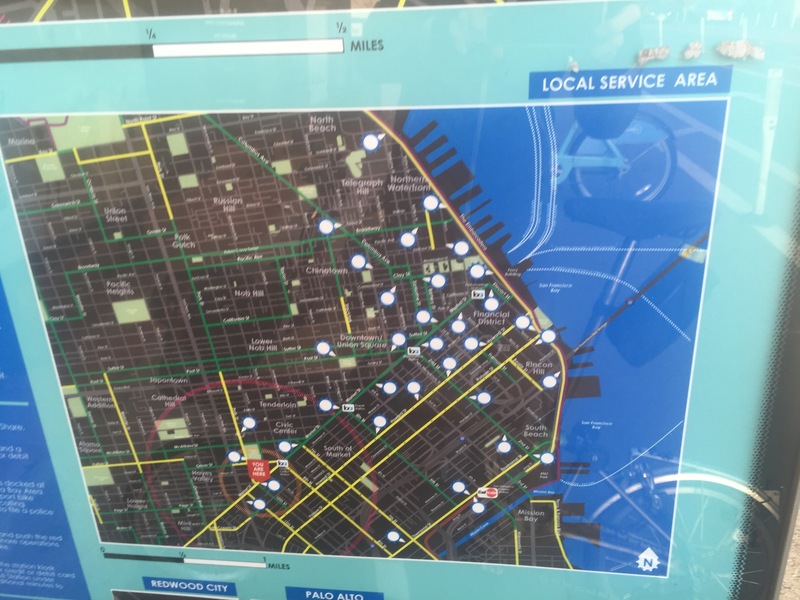 Useful wayfinding / route markers, below. 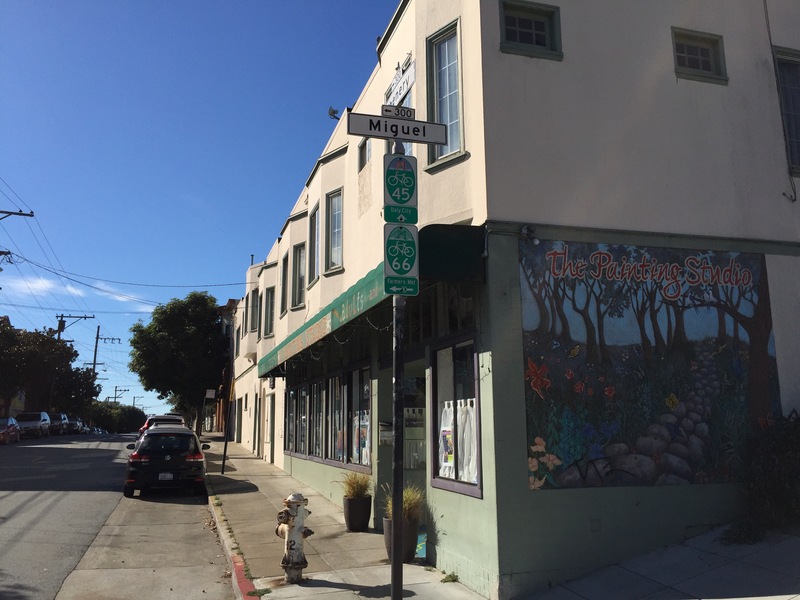 I didn’t go out of my way much to avoid the hills. In my limited explorations I didn’t find them to be insurmountable. 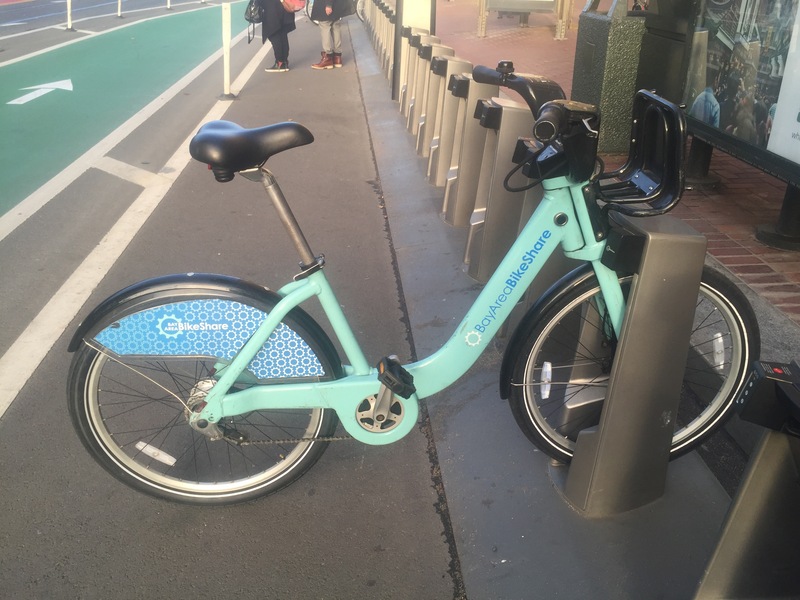 I did see some electric bikes, too, a good strategy if you need it. 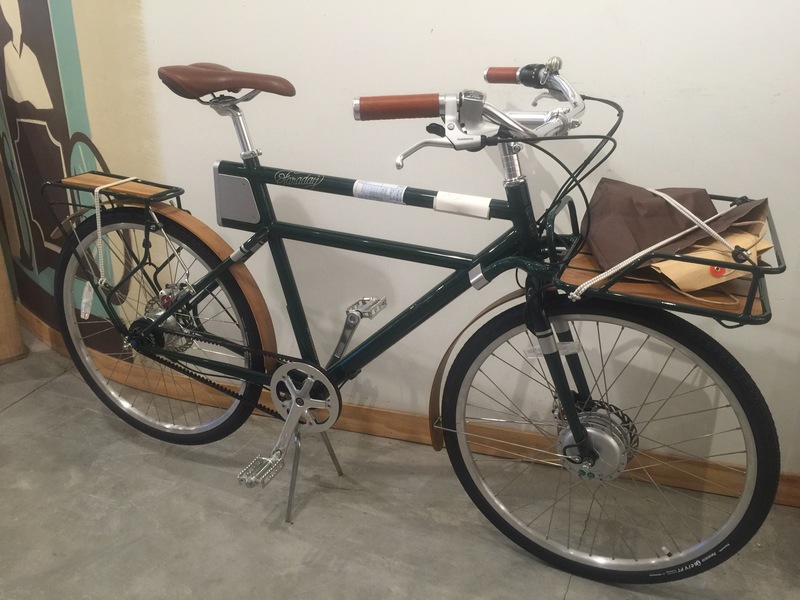 Here’s a classy example, the Faraday, seen at Huckleberry Bikes on Market Street. Batteries concealed in the down tube, belt drive, integrated lights, fenders and a frame-mounted front rack. About $3500.